The “Coventry Carol” is a Christmas carol dating from the 16th Century. The carol was performed in Coventry as part of a play called The Pageant of the Shearmen and Tailors. The play depicts the Christmas story from chapter two in the Gospel of Matthew. 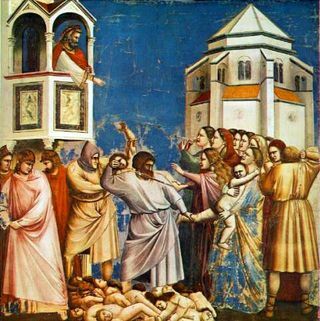 The carol refers to the Massacre of the Innocents, in which Herod orders all male infants under the age of two in Bethlehem to be killed. The lyrics of this haunting carol represent a mother’s lament for her doomed child. It is the only carol that has survived from this play. Our knowledge of the lyrics is in considerable doubt, as the only surviving manuscript copy was burnt in 1875, and only two poor quality transcriptions remain from the early nineteenth century. Next PostNext #11: Let It Snow!